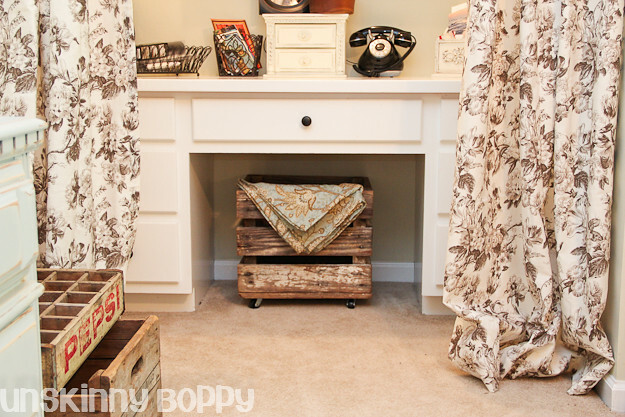 How to Recreate Pottery Barn Style without the Price Tag: Office Reveal! 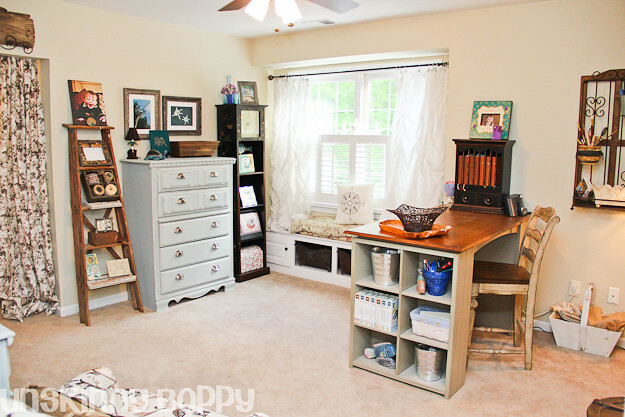 Recreating Pottery Barn Style Without Buying A Thing From Pottery Barn: My Rustic Home Office Reveal. 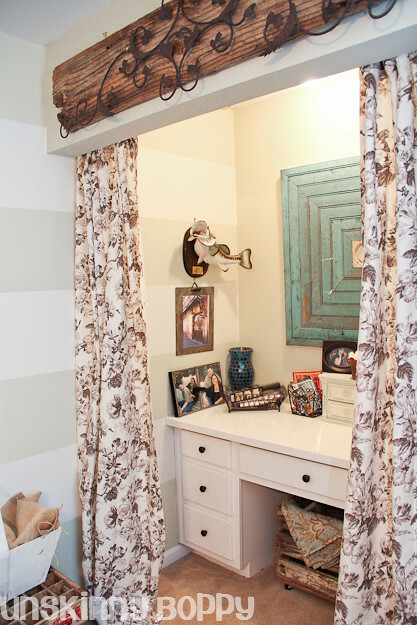 One of the biggest projects on my 2012 Diyables and Would-Be-Niceables list was giving my home office a big facelift. Since we moved in this house it’s been this big giant vanilla room that was so boring and blah. I finally made it a priority to get it finished after seeing some really great home office inspirations a few months back. 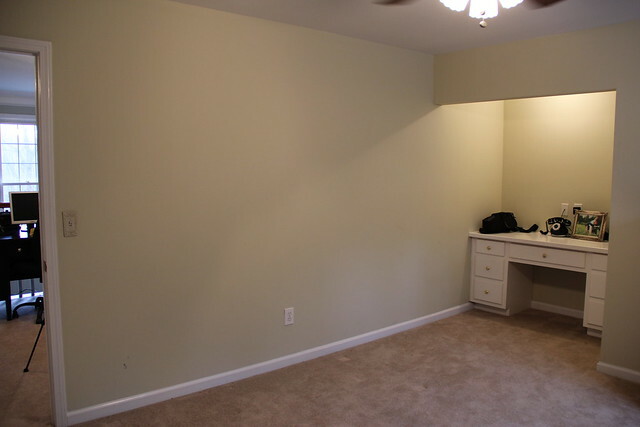 Here is what the room looked like before. Vanilla. Boring. Pretty ugly. And then I added a few stripes. And the room transformation began. The goals for my home office were to 1.) Shop from my own house and try not to buy much. and 2.) Make it 100% my own. Me. Mine. Beth’s. Nobody else’s. Now y’all know I still bought some stuff, but I shopped from my house a lot too. And, sure, I gathered a ton of ideas from Pinterest and other beautiful blogs for inspiration, but I wanted to make this room truly my own. After living with my house on the market for nearly two years and having a lot of this stuff packed away it’s nice to have it all back out again. Plus, I let myself run free in this room. Whatever I wanted to do, I did it. Remember how you decorated your room in high school and college? How you didn’t think about anyone else but yourself in the design process? How long has it been since I just plastered the walls of a room with everything I loved that meant something special to me? A long time. When I first got married and registered for new things I made our first houses pretty with new stuff, but I removed a lot of the personal (and I mean really heart-tugging kind of personal) touches because I thought they were tacky. It’s still something I struggle with now, and I’m trying to make my design more meaningful and unique instead of filling my house with mass produced stuff. 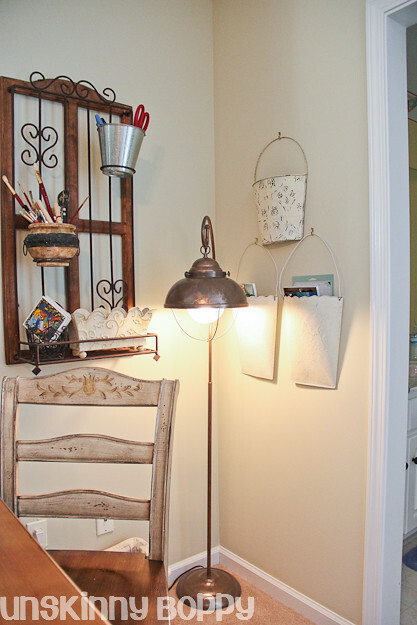 But, I do love me some mass produced Pottery Barn, so I wanted to incorporate a lot of that look into this room without the price tag. Lord knows I had plenty of stuff that I’ve collected over the years to fill the space. That’s what I’ve done here in this office. I’ve filled it to the brim with my collections. And it makes me very very happy. It’s the perfect blend of pre-married Beth combined with grown up 2012 Beth. I like it. I put a sneak peak of the progress over on my facebook page and received a few questions about where I bought the curtains. That’s the downside of blogging about things that you have had for years- there are no sources for the stuff anymore. I’ve tried to link up the big new stuff that I’ve bought, but if you have any questions just ask. And here it is now! Lots of updates in a few months! 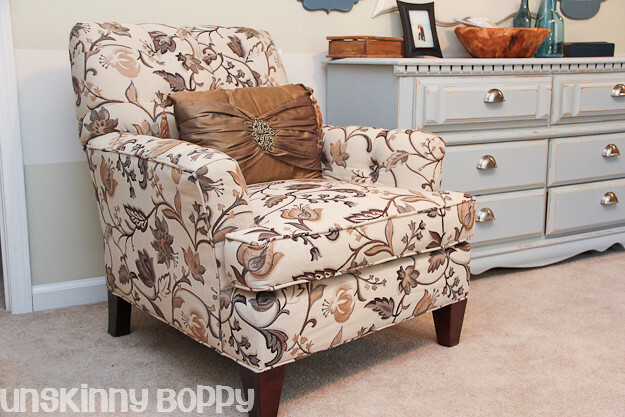 One of the few things that I actually purchased for this room was this pretty patterned chair. After some negotiations (and buying another chair for my sunroom) I got a hefty discount on this pretty chair. I’m really please with the way it works in the room. It’s comfortable and compact, too. Prerequisites for this room. I’ve had the project desk for a few years. It was bought at Pier One going out of business sale. I seem to frequent those things. 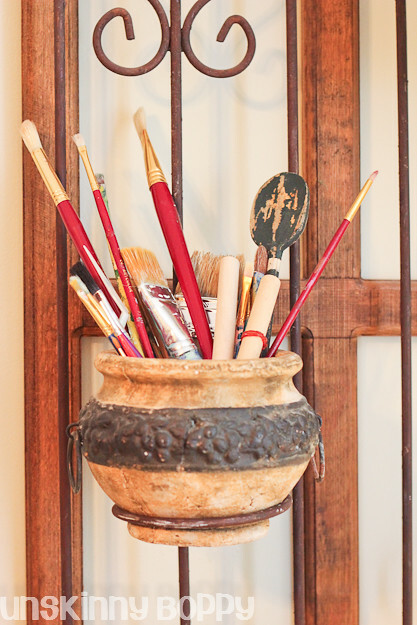 I used galvanized buckets for storage and a fabric mod-podged terra cotta flower pot that I made in the mid-90’s to hold pens and pencils. Cricut cartridges get some prime real estate on the shelf along with some other fish knick-knacks from high school field trips to aquariums. 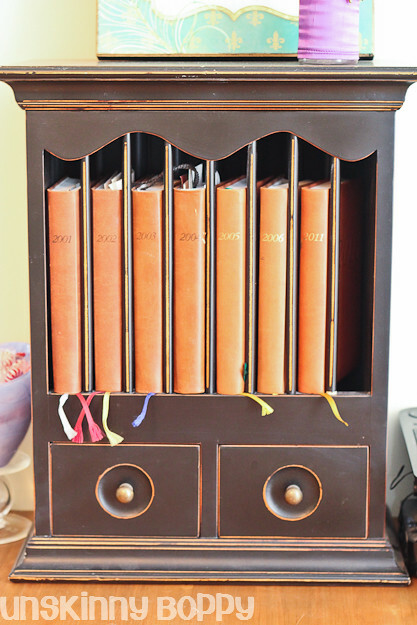 On top sits a plate rack that holds my collection of leather bound journals from 2001-2006 and a lonely 2011 one. I guess between 2006 and 2011 I blogged instead of wrote things down. I have a matching 2012 one so I’m trying to keep up with journaling better. The window seat got a mini facelift with a new curtain rod, a new pillow and some starfish that I bought at the beach a few weeks back. 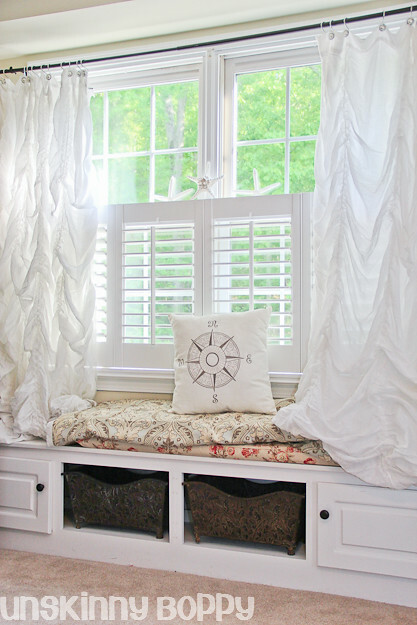 I repurposed the old sunroom curtains for one of the window seat cushions, breaking my sewing machine in the process. So the top cushion just got the old “wrap the fabric around it and call it done” treatment. I really dislike sewing. 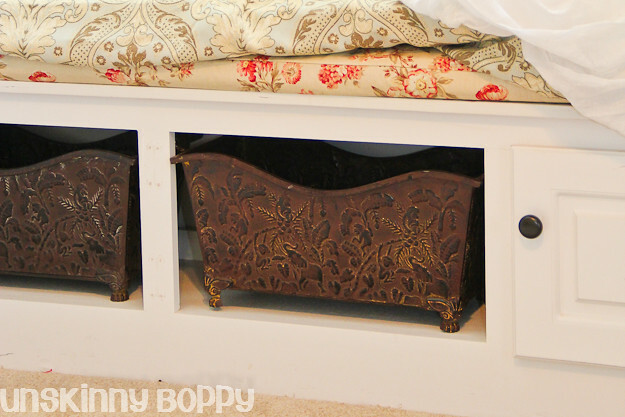 I took two of the cabinet doors off of the window seat and replaced with these metal baskets that I got as a wedding gift. I was excited when I found out they fit perfectly inside. I also spray painted all the brass knobs in the whole room (ok, house) with my trusty can of oil rubbed bronze spraypaint. I love that stuff. 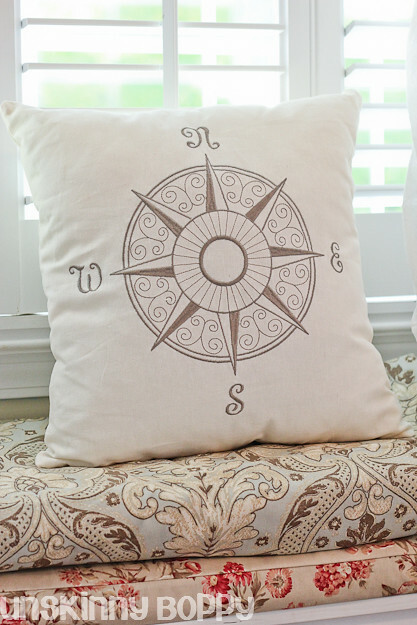 Another splurge for the room was this beautiful compass pillow that I found at my favorite place to shop on the beaches of South Walton: Kathleen’s Kottage. She’s right before the bay bridge on Hwy 331 in Santa Rosa Beach, Florida. A must-stop place while we are in that area. Since I got engaged in a bass boat on the lake to a man on bended knee with an engagement ring inside of an old compass I’ve got a little thing for all things nautical and compasses. I couldn’t turn this pillow down. I debated about it, but I’m so happy I bought it now. 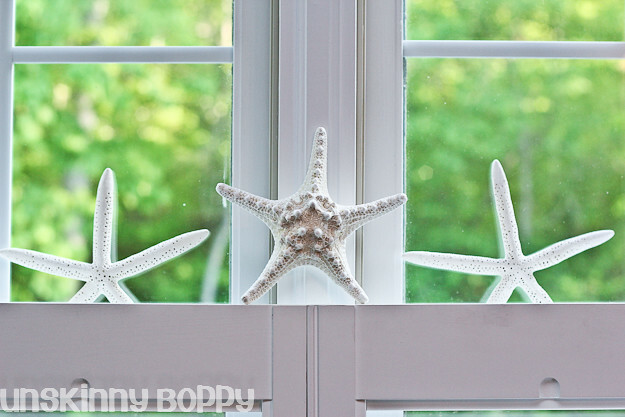 These pretty starfish in the window also came from Kathleen’s. The clock has been around many years. I debated about painting it something different, but I’m ok with the black for now. I might give it a facelift in the future. 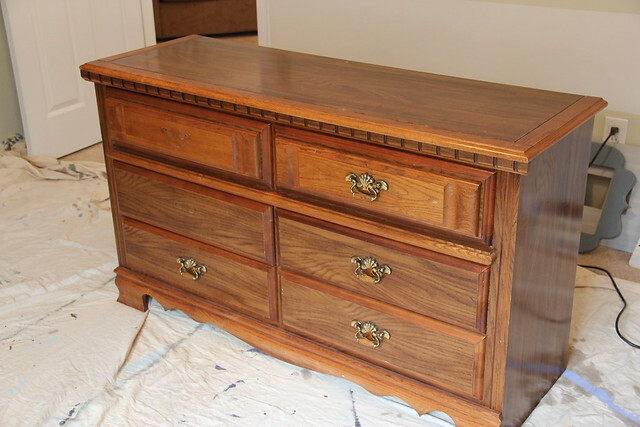 I love the way the dresser and chest turned out. The light blue is perfect in this room. Hanging on the wall above the chest are my favorite photos from a local Helena photographer whose name escapes me at the moment. 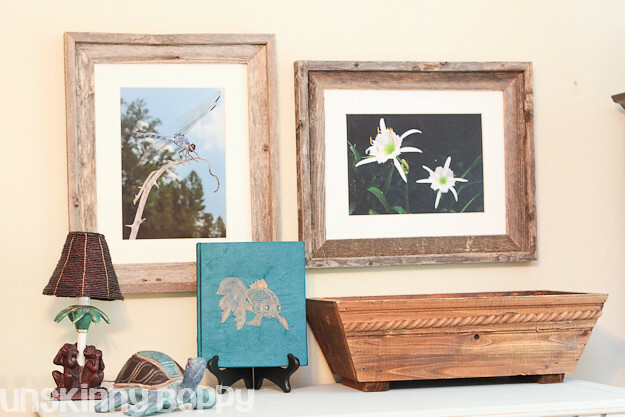 He took these beautiful pictures of the endangered Cahaba Lily and a pretty blue dragonfly. On top of the dresser is a “See no evil” lamp that I bought in 1999. I purchased a matching one for my boss at the time, who was a great mentor to me. We are now facebook friends, and I still respect her very much. The turtle was a gift from my mom when I was in high school. He got a little updating today with some oil rubbed spray paint as well. Updates on that later. 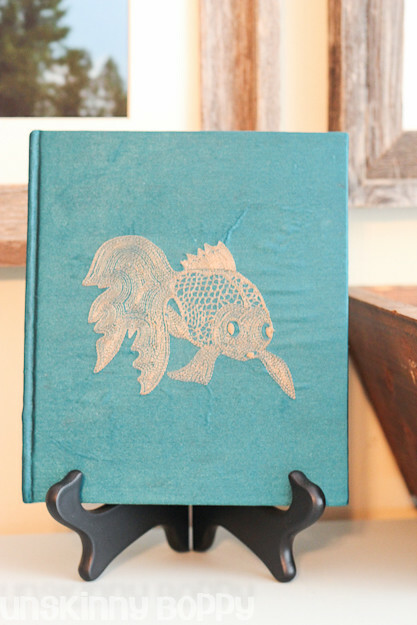 The green fish journal was a gift from my best friend Martha in 1999. I kept it as a travel journal for many years. 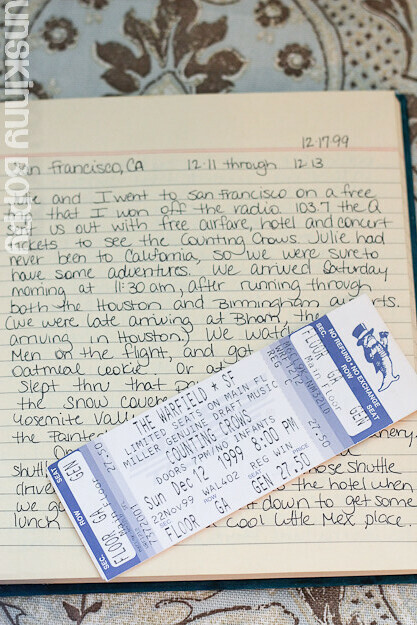 The first entry is from a trip to San Francisco I took with my sister in 1999. I won a free trip from a local radio station to see the Counting Crows in concert. What a great memory! We had so much fun on that trip. I guess this is proof that I’ve always been a diary keeper. Inside the wooden trough on the chest is all my paint fans. I’m constantly searching for these things around my house, so I am going to try to keep them in this designated spot from now on. Wish me luck. The old ladder came from my husband’s granny’s boathouse. 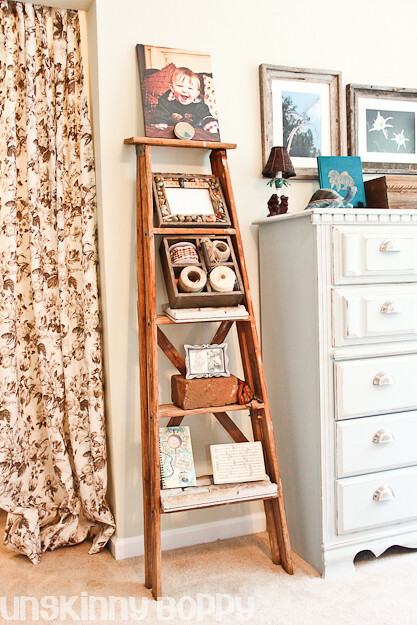 It was his grandfather’s ladder for many years, and it’s got a plenty of beautiful wear and tear on it that I just love. It’s perfect for this room. On top of it is one of my all time favorite photos of Baby G. He was one year old in this picture. Where did my little dude go? So cute. If you’re wondering what is sitting in front of it– it’s a fish hook holder that belonged to my Pop. Many, many memories attached to this little piece of round plastic. The rusted hooks are still inside. I told y’all this stuff was personal and kinda tacky. But it’s mine, and I love it. 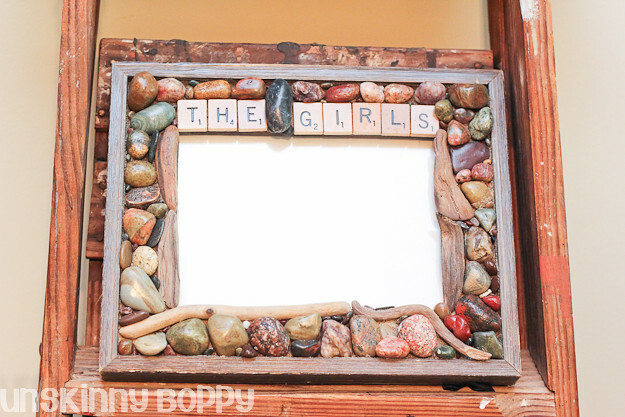 Below that sits rustic little picture frame that I bought at the first girls get together in Columbus in 2008. I’ve only had it for like nearly 4 years or something. And yep, that’s an empty picture frame you see. 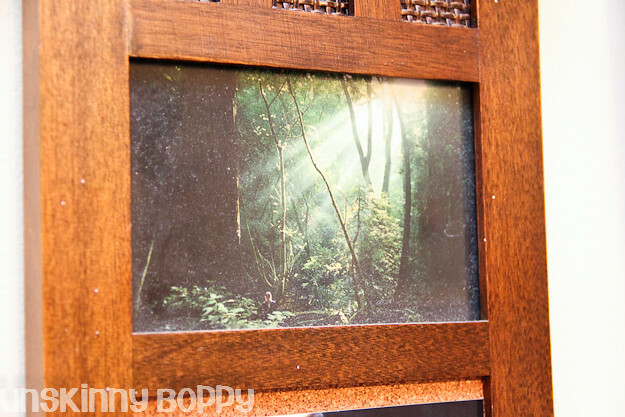 I have been meaning for years to put a picture in that frame, and I just keep forgetting to get one printed out! That’s a terrible excuse, since I have printed many photos printed since 2008. 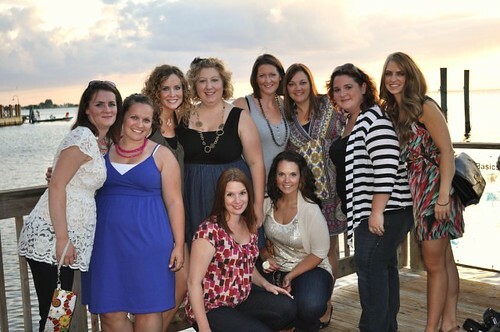 I swear on my next Costco run I’m going to have this one from our Fort Myers girls trip printed to put inside the frame. It’s my favorite pic of my best friends. On the shelf below that sits my balls of twine. I use this stuff for everything, and it’s great to know exactly where it is at all times. Might as well make it pretty and display it, right? This right here, well…I probably shouldn’t admit what this is. This is a cobblestone that I stole one night in college from the streets of my alma mater with my two best friends. I wonder if Braxton and Martha still have their bricks? Great college memories attached to that cobblestone. There are two pictures side by side in that frame sitting atop it. One is my Granny when she was younger sitting on a boat looking all beautiful and windblown. The other is my granny and my great-granny eating watermelon on a front porch. Doesn’t get more Southern than that. These are my people. This is where I come from. Inside the silk pouch is my charm bracelet with all my charms I’ve collected since I was kid. The bottom shelf has yet another journal. 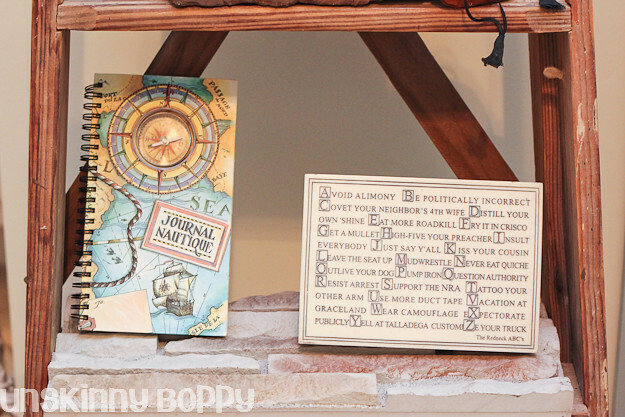 This one was our lake cabin journal that I bought on a ferry between Victoria and Vancouver. . 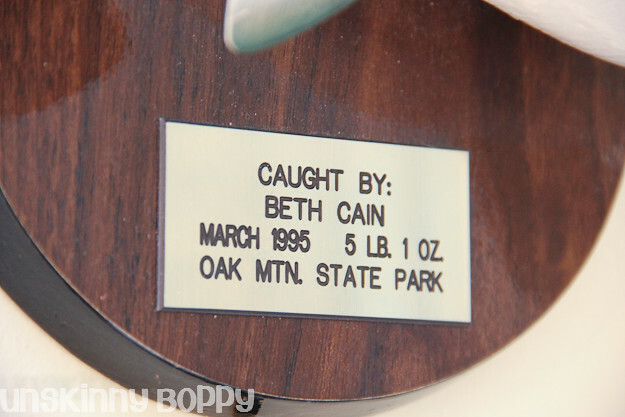 I documented every time we went down to the lake cabin in that book. I wish there were a few more entries, but that’s ok. We still have access to plenty of beautiful lakes. The plaque beside it is “The Redneck ABC’s”. ‘Nuff said. So the little niche where the built-in desk is got some curtains to dress it up a bit. These are the Walmart curtains from the dining room at the old house. Here’s a peek behind one side of the curtains. I told y’all this room is all about me, so here is what you need to know about me if you’re new to this blog. I love to fish. I always have. I hopefully always will. I’m a born fisherwoman from a long line of fisherwomen. I married into a fishing family. I didn’t buy this fish at an antique store like so many of the mounted deer heads and antlers that are popping up all over the place these days. I’ve had it mounted on my wall since I was 17 years old fishing with my high school boyfriend. 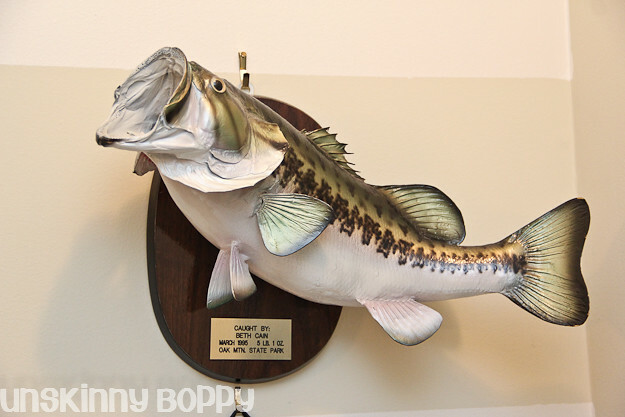 This largemouth bass has been with me through thick and thin so it deserved a place in this room for sure. 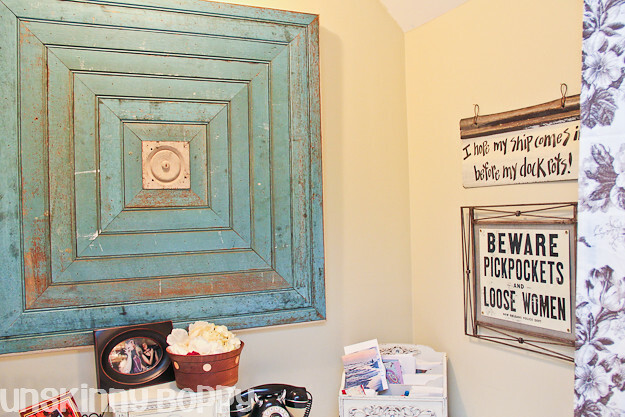 My big blue beadboard plaque from Southern Accents in Cullman looks perfect hanging in this space. I love this piece SO much. Over behind the other curtain hangs my old “Beware of pickpockets and loose women” sign. 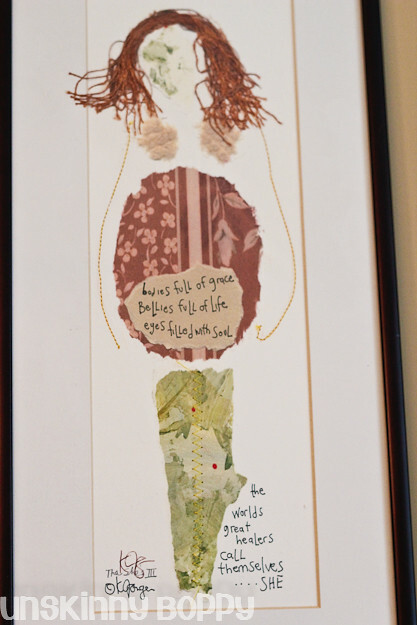 This is another piece that was hanging in my first house. The advice was probably more applicable back then, but I love it still. Since I don’t plan on using the desk as a desk too often I took the old crate that I bought last year and added some casters to it and rolled it underneath the knee space. I saw a similar idea on Pinterest and thought it was a great one. 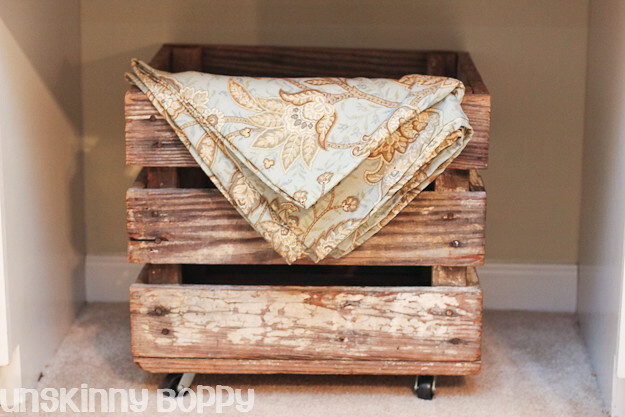 Instant rustic rolling storage! I wanted to incorporate a lot of the old Beth/ present Beth into this room. 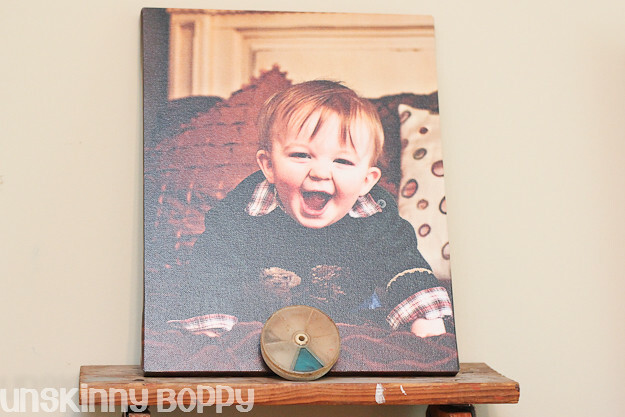 A weathered piece of wood that was meant for Garrett’s playroom became a backer board for one of the iron scrolly things from my old house. 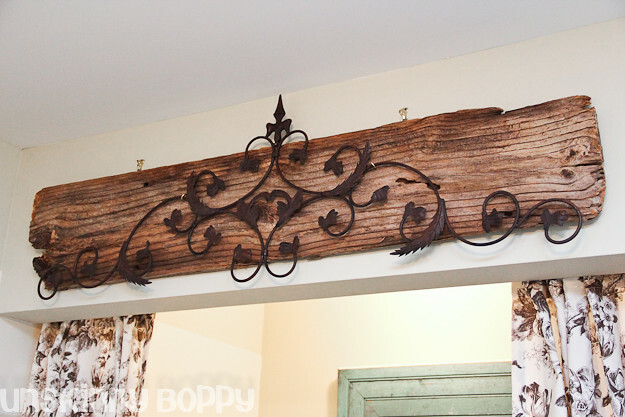 I like the way the weathered wood makes the scrolly iron plaque less fru-fru. 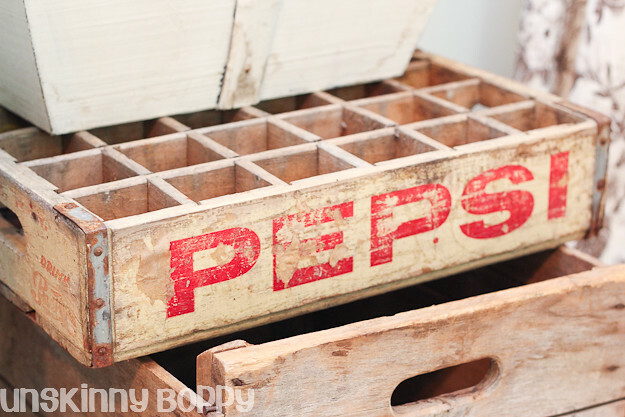 I incorporated more Pottery Barn rustic-ness with some more crates, including this awesome Pepsi crate I scored at -an antique store in Montevallo. 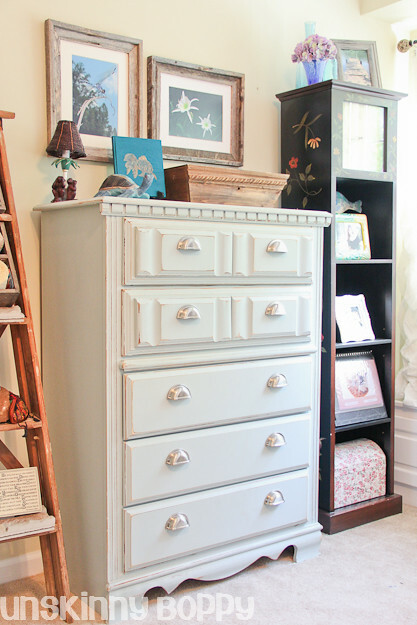 The dresser and chest are my old high school bedroom furniture that my parents bought for me in 1992. I distressed them and painted them both, but I’ll save all that DIY info for another post. Here is a before of the dresser. Pretty typical ’90’s oak dresser. I’m so glad I took a sander and paintbrush to it! 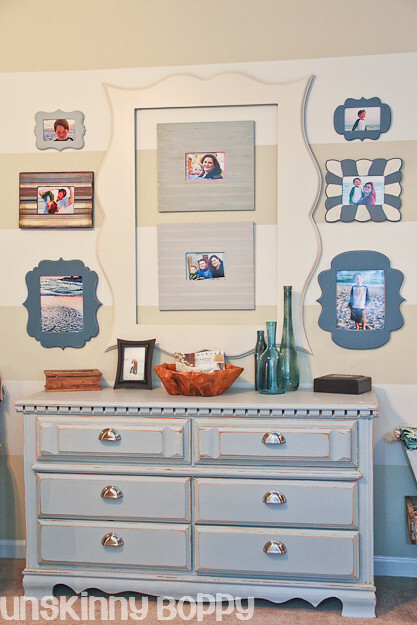 On the striped wall I used the newly painted dresser with a collage of funky picture frames. I bought the extra large frame from Jody of Click Workshops. 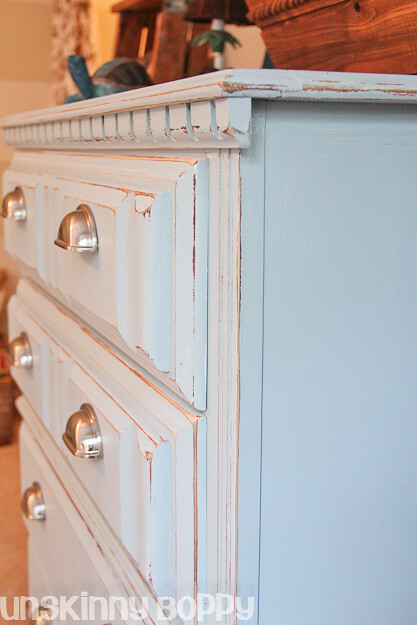 I originally ordered it in this bright blue color but my plans for it changed once it arrived at my house so my husband painted it creamy white for me. 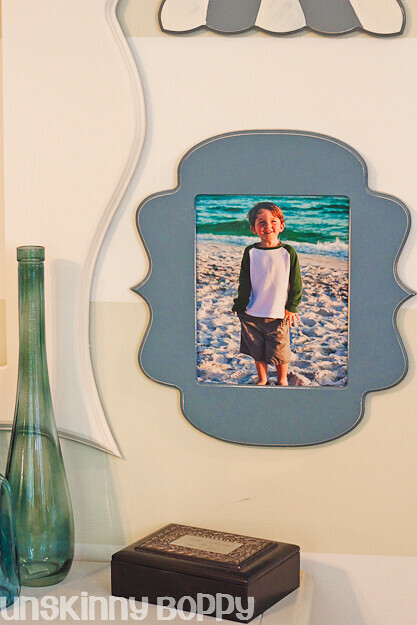 I used it as a border for two smaller beadboard frames instead of having one gigantic photo inside of it. The other frames came from a store called Cut it Out Already. 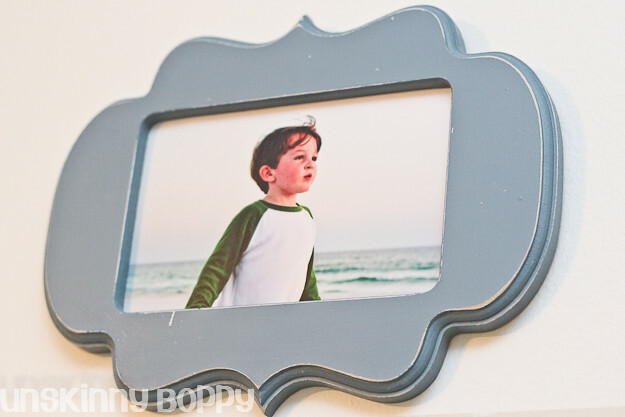 These frames were SUPER SUPER cheap compared to similar frames like Organic Bloom, etc. The only catch is that you have to paint them yourself, which shouldn’t be much trouble for all you DIYers out there. I painted mine in several different shades of blue, even though they all look the same color in this picture. I swear they are all different, though. 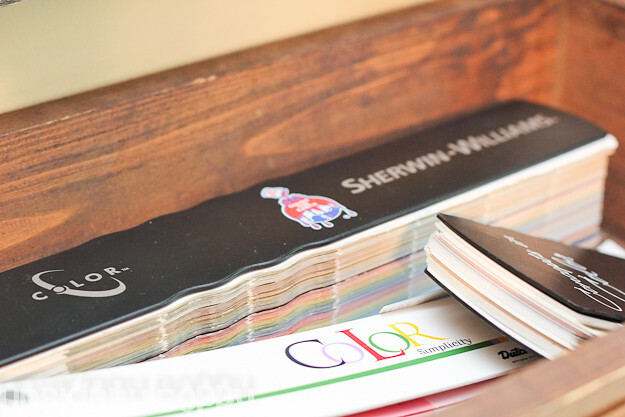 I was putting more of those Sherwin Williams samples to good use! I got a little creative with this one and painted a sunburst type pattern on it. Love it. The 8×10 sizes are my favorites. They are such great shapes. 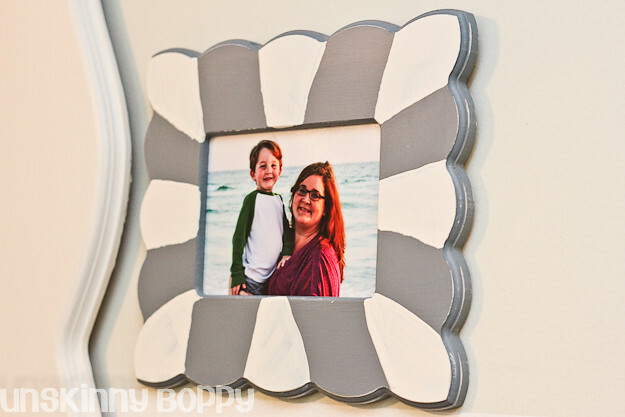 I used two more funky frames over on the other side along with a striped frame that I’ve had for a few years. 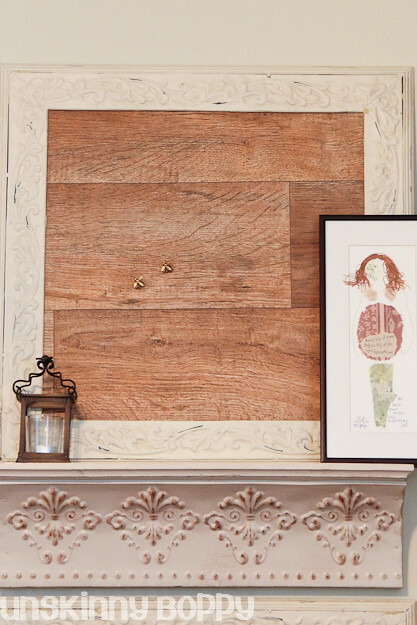 The beadboard frames in the center are from Cut it Out as well. 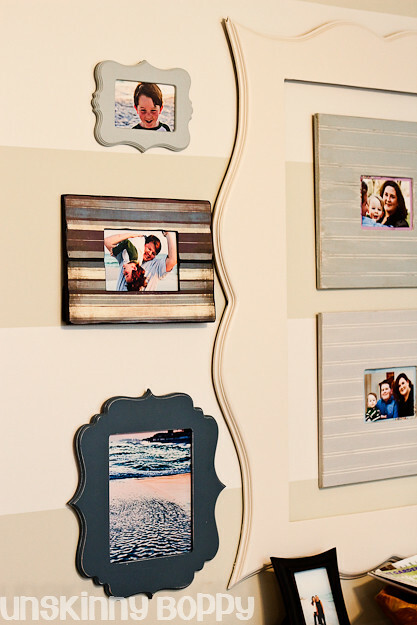 I’m so happy with the way this collage turned out on the striped wall. On the wall behind the project desk I used an old Pier One wall hanging as a pretty way to display some things like paint brushes and scissors. 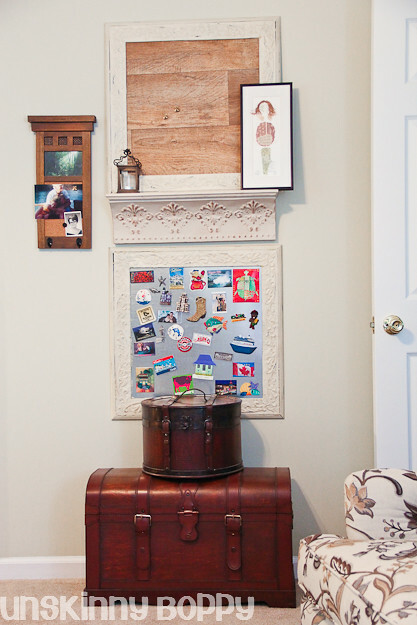 I also have my Cricut scrapbooking paper in the white buckets on the wall. Hidden in plain site and all that. My final big recent purchase for this room was the beauty of a floor lamp from Cabelas. I bought this at the same time as my staircase sconce light. I love this line of fisherman lighting from Cabela’s. 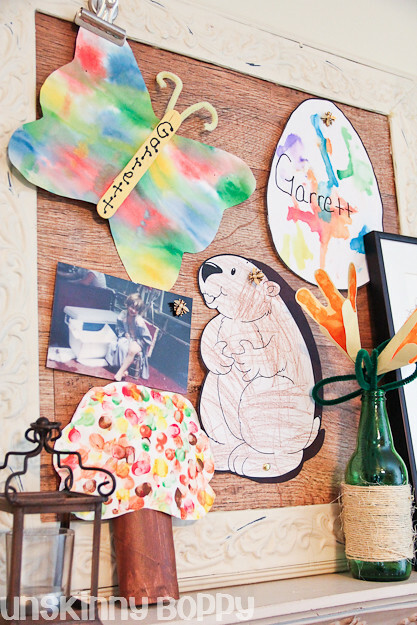 I DIY’ed this cork board and magnet board. I plan to show you all the details in another post. The wood looking stuff is actually a scrap piece of vinyl sheet flooring. I did fill up the corkboard with stuff- mainly G’s cute projects from school including the infamous “Beaverhog” he colored on Groudhog’s Day. 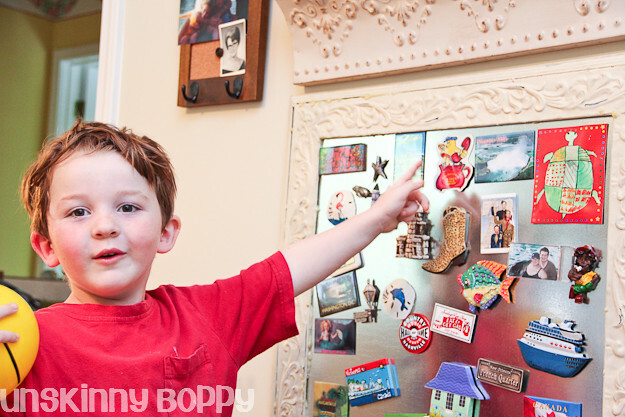 The magnetic board is a piece of sheet metal from Home Depot. 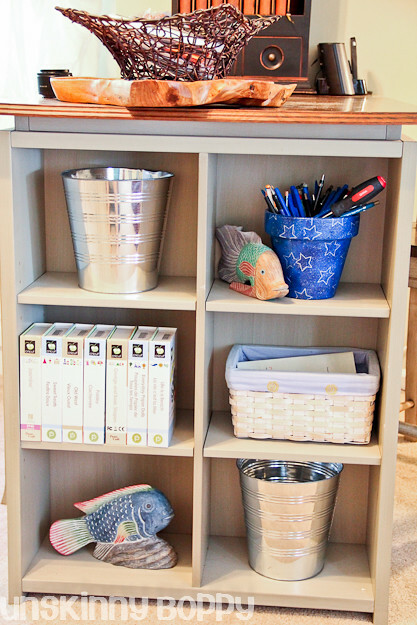 This was one of the purchase I made with the $50 Home Depot GC I won from First Home Love Life’s blog giveaway last week! 🙂 Thanks Christine! I intended to put stuff on it, but when I dug out my old magnet collection I realized my magnets ARE the stuff, so I just left them as is. I’ve collected these for years from all over the place, and each one reminds me of the vacation or life event when I acquired it. I love simple reminders like that. Garrett loves playing with them, too. The Mellow Mushroom man cracks him up. I love this art print that my mom bought for me a few years ago. That pretty much sums up the way it feels to be a mother. And I feel like that art piece is what brings this room full circle for me. I see so much of my history in this room that reminds me of my childhood, teenage and college years, but nowadays I’m a mother above all else. I’m blessed to call myself one of the world’s greatest healers. A She. We are amazing creatures, right? Thanks for giving me the opportunity to share my little tidbits of my life momentos with you. This room is an intimate place with lots of history that needed an explanation. It’s been therapeutic assembling it all together, in a way. Like weaving a tapestry of my life together into one big beautiful space. Everything about the room feels complete to me now. That’s when you know you got it right. 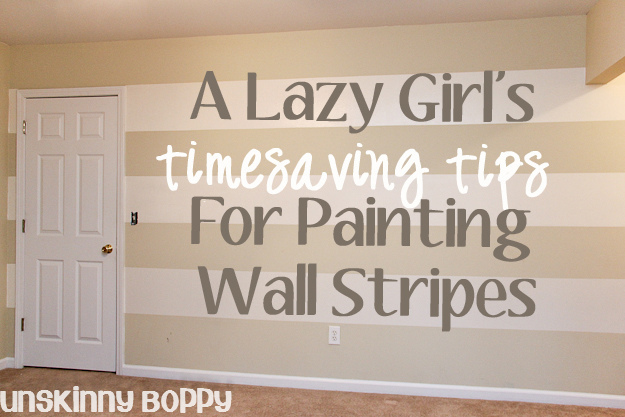 If you liked this post, be sure to read my Lazy Girl’s Timesaving Tips for Painting Wall Stripes! Love it!!! 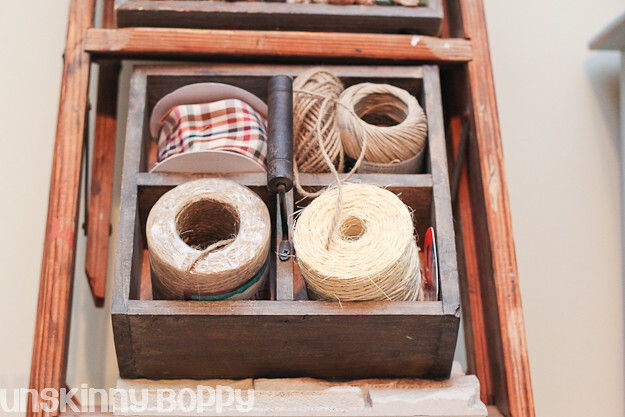 This makes me want to go home and redecorate and organize my craft room (aka junk room) …love your style!! Beth, this is amazing in so many ways! It’s so…you. To be surrounded by so many things that remind you of your past, your present – there are really no words for that. I know this room brings you lots of joy, and it’s such a beautiful space with so much life. Amazing. Amazing. Amazing. 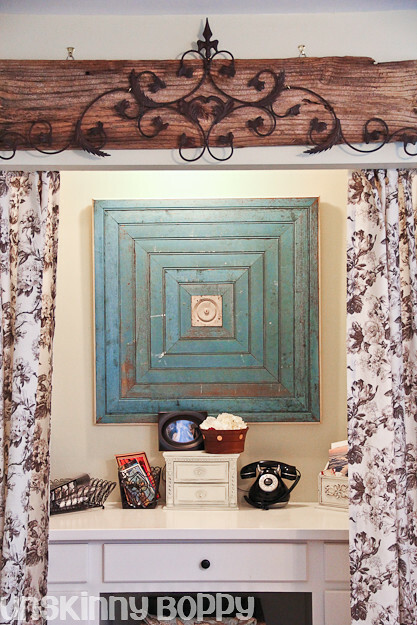 Love that you made the space yours, instead of a cookie cutter room containing all the latest trends. 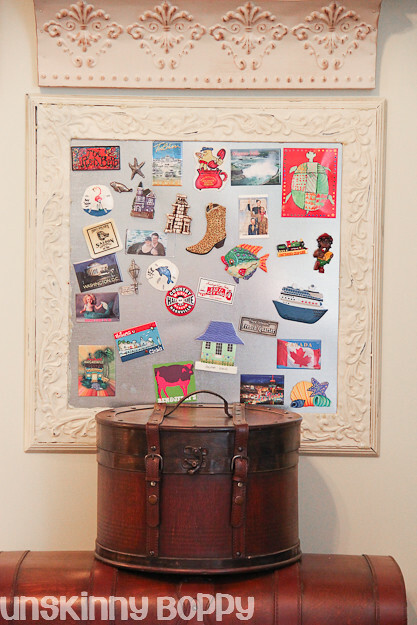 I just wrote a post on collections, and how they add personality to a home. Life is short, we should surround ourselves with things we love! Great job! I’d love to stay in that room creating all day long!!! This room is beautiful! You have so many personal, well thought out touches!! And those curtains are sweet! WOW! WOW! and WOW! 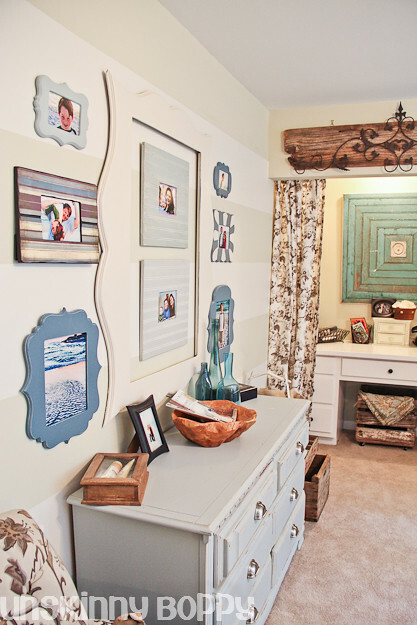 I’m going to Pin it all – it’s gorgeous and you’ve done a beautiful job with your office! You room is amazing! I love every little and big detail! You did an awesome job! I’m getting so many ideas from this one post! Now this is just pure talent! Unbelievable, I LOVE IT! Love, love, love! Words can’t even describe how perfect this is! You are so talented, Beth! You are so much classier than I am — if I designed a ‘me’ room it would be covered in Britney Spears posters. 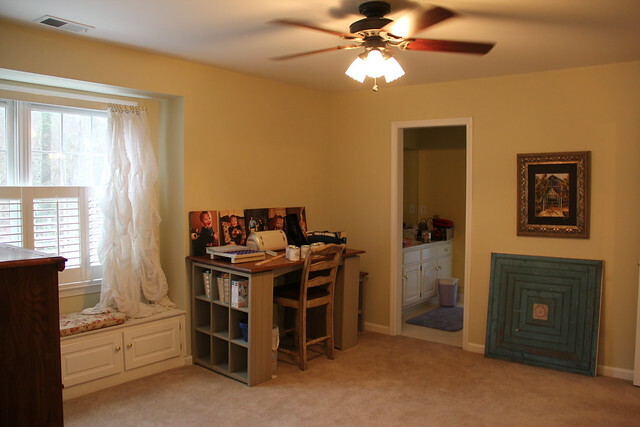 This room is amazing and I am so happy you took the time to make yourself such a great space! What a great room! It looks awesome. L O V E! Beth, it’s gorgeous! I love all the little details. My house has been on the market for several years and I haven’t wanted to do anything to it. I’m so ready to make a few changes here and there. Thanks for the inspiration!! I keep coming back — its like my favorite store that takes hours to see everything. EXACTLY my type of space. What a great post! Not only do I love the room but I feel like I know you now 😉 I love all the personal touches and the stories that go with them. Thanks for sharing. What a Gorgeous room! 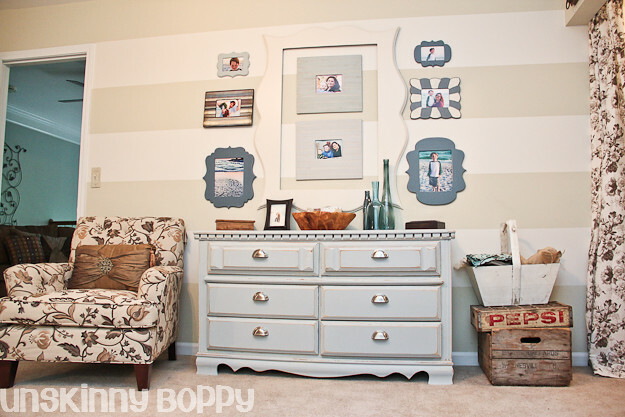 LOVE the stripes, LOVE the dresser & chest of drawers, LOVE the small touches that make the place yours! Job well done! What a beautiful, functional room. How wonderful to surround yourself with so many trinkets that have so much meaning! What a great place to work and create. I’ve been following you for awhile, but first time to comment. You’re a woman after my own heart. I just recently changed a bedroom into my craft/woman cave/guest room and the first thing my hubby said was there’s so much stuff all over! I loved the tour and hearing the stories behind the stuff! I have tears in my eyes & I am missing you so much… that’s how much that room is Beth. Love it, both as a design piece and as your open journal. Perfect! OHMIGOODNESS!!! This room is ABSOLUTELY STUNNING!!! I can’t believe all of the personal, thoughtful touches you added around the room. It’s not just stuff…everything is just drop dead gorgeous!!! OK, so when are you coming over to my house? 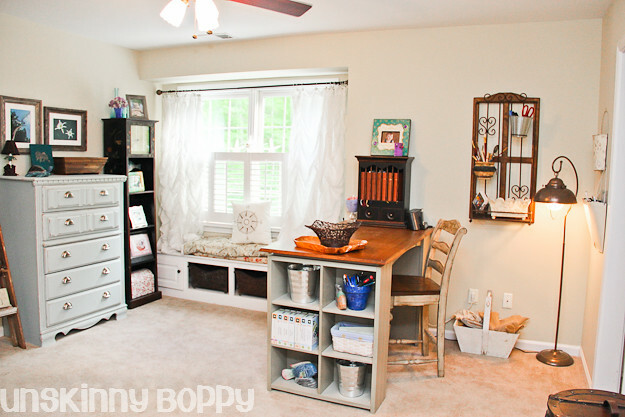 I could totally use a new craft room!! Ah, you guys have made me laugh, smile, cry(!) and smile some more with all your sweet comments. Thank you all so much! @Allison, like I told you via text– Happiness and class have nothing to do with the another. I’m SO glad you put up your Britney posters in your office. 😀 That made my DAY! And MWA don’t CRY! I miss you too! I’ll see you one day this year, I promise. To everyone else, thank you so much! I really appreciate all your kind words. I almost forgot it was an office. The room looks perfectly peaceful! Again, I love all that you do! I can totally fit myself in that room. 😉 Beautiful!!! Lovely!! I especially love the gathered white curtains. So romantic and vacationy!! Beth, your office is wonderful! I’m a little jealous of the space. Someday, maybe I’ll have a room to combine past and present me. I’ll have to start collecting my things so I can shop from home too! Wow! Loved reading your words and looking through your pictures!!! I wanted to enlarge EVERY one of them and get a closer look (but I couldn’t) so I really like the close ups! And a couple of times, I felt like tears were coming to my eyes! I think everyone needs a room like this just for themselves. Great great job!!!! OHMYGOSHBETH!IT’SGORGEOUS!!!! I want to live there. Wow! 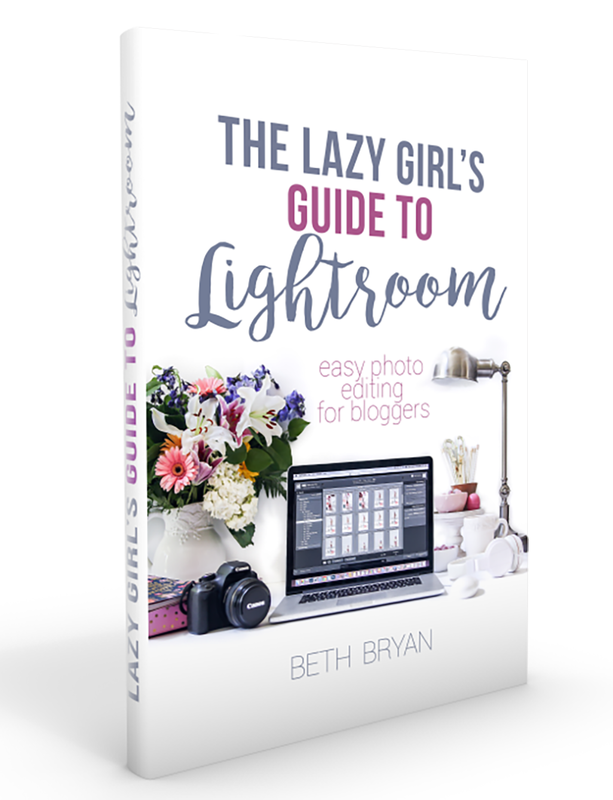 I think you’d like to ‘show off’ in a guest post/feature, right? 😉 I love every single detail. It is STUNNING! Pottery Barn, who? 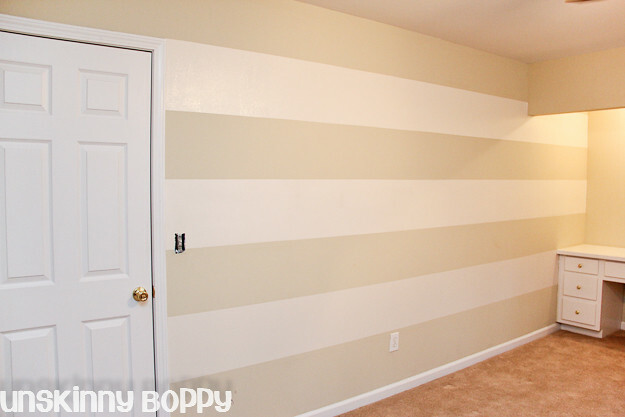 I want an Unskinny Boppy inspired room! So cute! It turned out so beautiful! 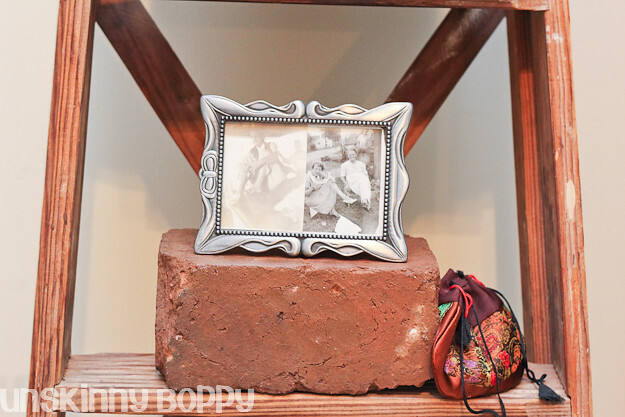 It’s so refreshing to see really personal items in your room! I also have things that might seem tacky or outrageous to most people but they mean the world to me. You pulled it all together beautifully and I know this room will inspire you so much more than before. LOVE it! 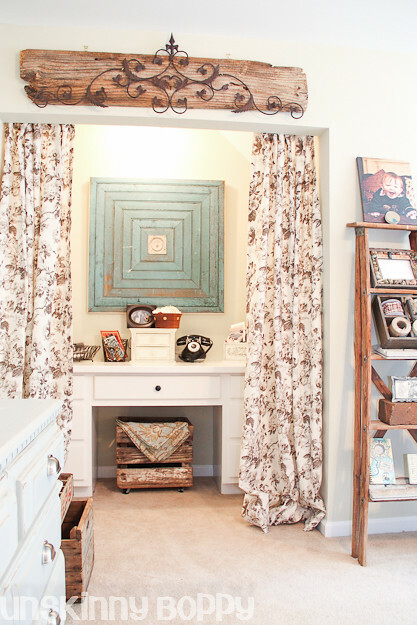 This is without doubt the cutest home office I’ve ever seen. If it was mine, I don’t think I’d ever leave it! This is amazing!! What attention to detail and what a lot of work. The end result is so worth it, though. 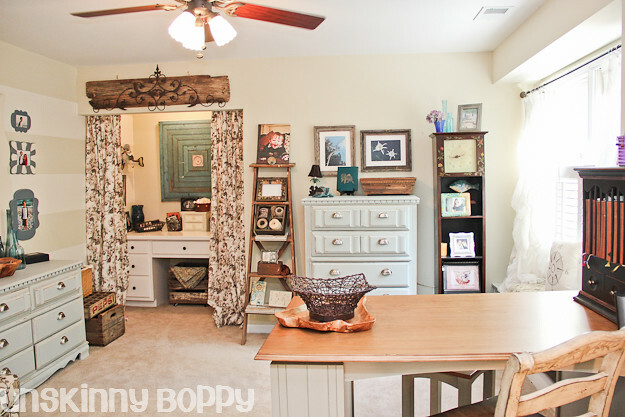 Congrats on your beautiful new craft room and thanks for sharing all of your great ideas!! I honestly had your inspiration post open in another window from early this morning cause I wanted my hubby to see it. Then I came across this and am BLOWN AWAY!!! This room is absolutely fantastic!! GREAT JOB. I love all the personal touches throughout. I can’t begin to tell you how much I love this room! It’s so comfortable yet beautiful and inspiring. 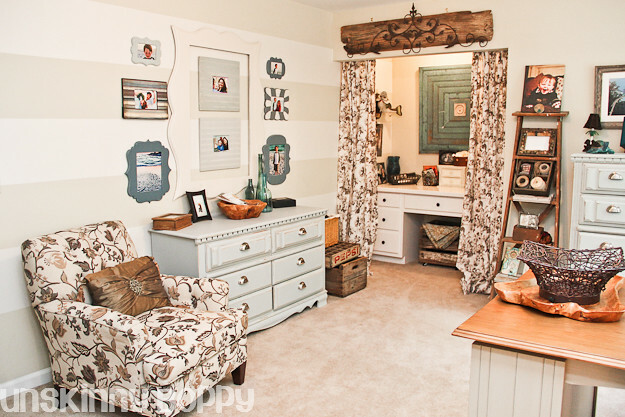 I love the personal touches, the mementos, the colors you used… The dresser is perfection, by the way. Pin pin pin! I am seriously in love with everything about this space! What a beautiful job you did. Oh my goodness, this space is gorgeous and SO inspiring! There are so many beautiful elements combined to make a fantastic space that I would never want to leave 🙂 So glad Karah featured it on The Space Between so that I didn’t miss it. I love these photographes, it’s stylish and simple. I start with these kind of designs but somehow I end up with a big mess after a few weeks, I just can’t keep it clean and simple, books and paper are piling up behind my back, at night, I’m sure of it! Soooo true. Looks soooo personalized I love what you did here! Very cozy and relaxed feeling in this room! 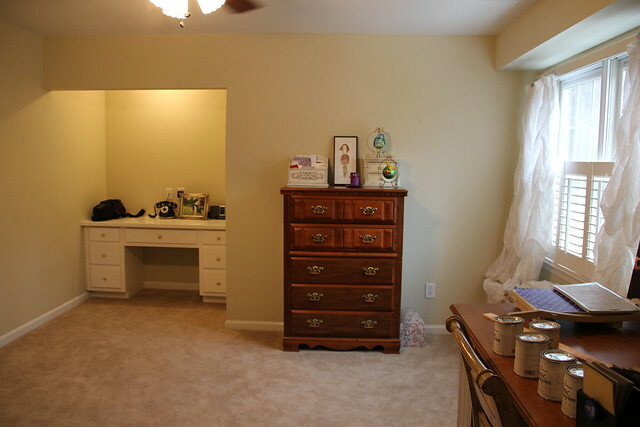 What color paint did you use on your office dresser? Hey – – – I LOVVVVE the white curtains in that room. can you please tell me if you made them? or if you bought them – where from?!? !